The magnitude of climbing Mount Kilimanjaro did not occur to me until I was on the airplane, flying past the tallest free-standing mountain in Africa. Seeing the mountain for the first time, I was overwhelmed by nervous excitement and humbled by the mass my brother and I would soon attempt to climb. That was the first time it truly occurred to me what we were in Tanzania to accomplish. Thinking back, I believe part of the reason the significance did not occur to me sooner was because Acanela made it extremely easy to plan the trip. Arrangements for hotels and airport pick up were done behind the scenes. All my questions were quickly and thoroughly answered by our trip’s planner. We were consulted by employees of the company who previously (and successfully) climbed the mountain. The logistics were so smooth that the transition between planning and doing was seamless. Before I knew it, the only thing left to do was climb. I learned a few weeks in advance that my brother and I were the only two climbers in our trekking group. I was not sure how to feel about this, but right away the small group gave the expedition an individualized feel. With years of experience, our guides understood when we needed to rest, drink water, and slow down, sometimes before we acknowledged it ourselves. Over the last 5 years, Acanela is estimated at leading a minimum of 180 climbers up Kilimanjaro, maintaining an impressive 90% success rate. This rate is possible due to this combination of small hiking groups, experienced guides, and a trekking schedule strategically planned to avoid Altitude Mountain Sickness (AMS). When we reached the next camp after hours of hiking, it was easy to collapse into bed (the Marangu Route hut’s greatest blessing). But shortly after arriving to that day’s camp, our guides led us on an additional acclimatization hike each afternoon. With the intention of avoiding AMS, we continued climbing on a path to experience a little of the next day’s altitude, before climbing back down to camp. 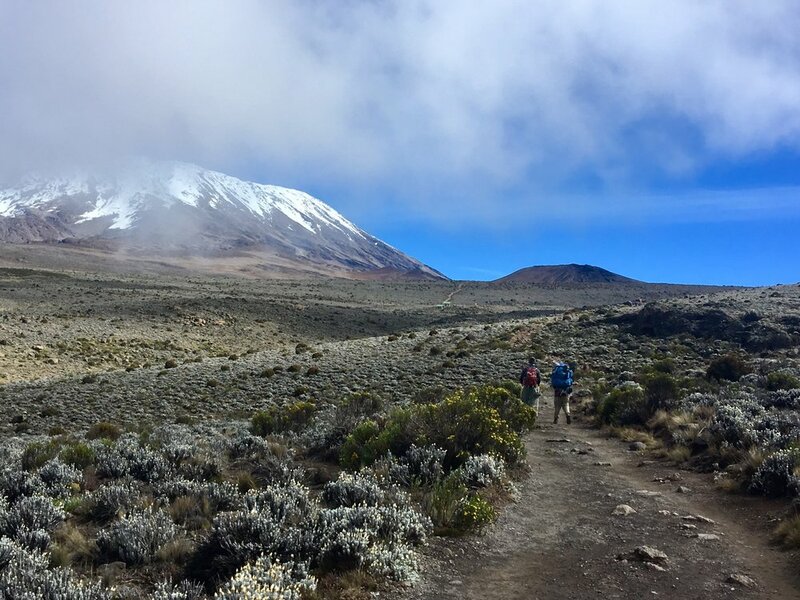 The 1 to 1.5-hour acclimatization hikes were always different from the path to the next camp, adding an extra opportunity to explore Tanzania. 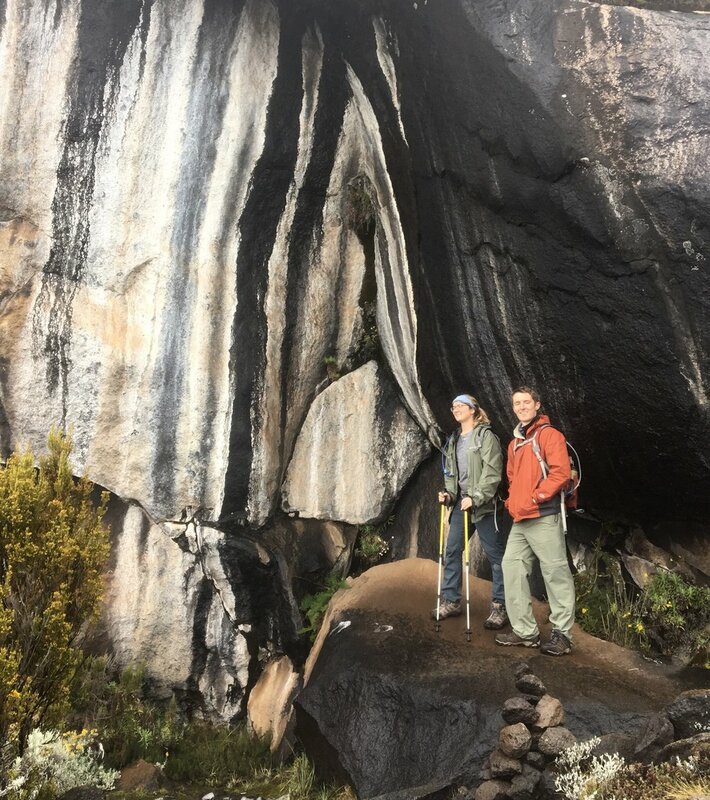 One acclimatization hike took us to a peak where we could see over the country’s border into Kenya, and another took us to the Zebra Rocks. One must-have item is a headlamp. We started the final ascent at midnight, and needless to say, we needed a light to see the path. A headlamp keeps both hands free for another useful item: trekking poles. The final ascent is steep and when we started getting tired, it was helpful to have something to lean on. Additionally, I found sanitizing wipes very helpful, using them before a meal or after a particularly dusty day. In the morning and at night, our team brought us a bowl of boiled water to wash up with, and I wished I brought some kind of wash cloth to dip in the bowl. Finally, there is the option to rent a sleeping bag at the start of the trail, but I felt more comfortable packing my own. Air compression bags were very helpful when packing some of the bulkier item, such as sleeping bags or coats. A Kilimanjaro story would not be complete without mentioning pole pole. Our guides constantly reminded us that to walk “pole pole” (pronounced poley poley), Swahili for “slowly slowly”. Rushing the hike will place undue stress on the body, whereas walking slowly allows the body to acclimatize easier. With this, I was able to successfully summit without Diamox or other altitude supplements. One day was spent almost entirely walking through the misty Moorlands, a damp and difficult hike. But the day after, we were so high in altitude that when I turned around, I was looking down on the top of the clouds. In hindsight, it’s almost symbolic to spend the previous day hiking through clouds, and knowing it was only blue skies from there. It’s possible that you will only do this hike once in your lifetime. It is a tough expedition to endure, but it’s over before you know it. Kilimanjaro is difficult, invigorating, terrifying, and beautiful. From this adventure, I left with a greater understanding of my own life. Never under-appreciate a bed or a shower. Community and support are two of your greatest resources. And ultimately, both on and off the mountain, slower more careful steps will get you to your destination faster.